Mark Rossi knows Key West. He is the owner of Rick's/Durty Harry's, one of the largest entertainment complexes in the city. Active in the local community, amongst other things, he is the founder of the annual Lobster Fest in which a section of Duval Street is closed to traffic and local restaurants set up stands offering various lobster dishes. The procceds are used for scholarships. In addition, Mr. Rossi is serving his final year as an outspoken City Commissioner after deciding not to run for re-election in 2015. Mr. Rossi is a Key West success story. When he came to Key West in the 1980s, Mr. Rossi had little money. Realizing the potential of its location, he raised the money to buy a restaurant/bar across the street from the landmark Sloppy Joe's Bar. 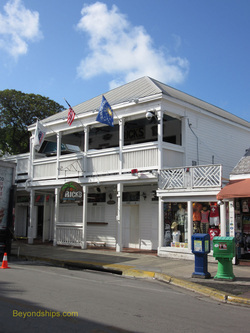 With the success of Rick's Bar, he expanded, purchasing the neighboring Durty Harry's and other buildings. As a result, his entertainment complex now includes eight bars which range from a polished champagne/martini bar to the tourist popular Tree Bar on Duval Street to the adult Red Garter Saloon. As a result, the complex attracts a wide range of customers including not only cruise ship passengers but also celebrities such as Led Zeppelin lead guitarist Jimmy Page who jammed with the house band on the stage of Durty Harry's one night. When his commitments allow, Mr. Rossi is an avid cruiser. Thus he is familiar with cruising not just from the perspective of being a businessman and a government official in a major port of call but also as a cruise ship passenger. He attributes this popularity to the easy character of the city. Among the memorabilia posted on the walls of the Courtyard at Rick's/Durty Harry's are numerous military insignias, naval ship models and other items related to the armed services. 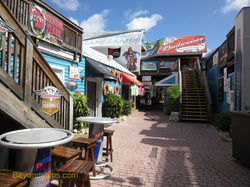 These items reflect another often overlooked part of Key West.